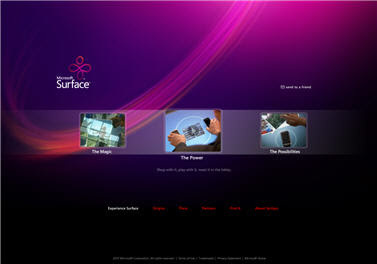 The launch of Microsoft Surface marks the beginning of a new technology category and a user-interface revolution. Surface, Microsoft’s first surface computer, provides effortless interaction with digital content through natural hand gestures, touch and physical objects. Surface computing breaks down traditional barriers between people and technology. Google Maps have a new feature and may be the best one I've seen: Street view. It's available in limited content now but you can click a street and look at a 360 degrees picture of the street! That's an awesome feature and can be extremely useful! You can have an idea what the street looks like. You can use the arrows to go in all directions. I can't wait to see coverage getting wider. Check out the Demo. Google is undertaking the most radical change to its search results ever, introducing a "Universal Search" system that will blend listings from its news, video, images, local and book search engines among those it gathers from crawling web pages. Incorporating an advanced approach to presenting information about Ubuntu, Ubuntu Unleashed aims to provide the best and latest information that intermediate to advanced Linux users need to know about installation, configuration, system administration, server operations, and security.